There is nothing easy regarding Beijing’s strategic calculus about North Korea (Democratic People’s Republic of Korea, DPRK). China’s difficult relationship with the DPRK rests upon balancing its vital interests: first, peace and stability on the Korean peninsula; second, its denuclearization; third, the preservation of its influential relationship with DPRK; fourth, crisis-prevention. In short, China seeks to balance the maintenance of the status-quo, while simultaneously trying to change it. By changing it, China aims to maintain the upper hand. A cost-benefit analysis of the losses and gains resulting from the pursuit of each of its interests mentioned above would require China to adopt a more assertive military stance. Of critical importance to any strategic calculations is context: not just the territory involved, in this case the Korean Peninsula, but also the global strategic landscape. Any Chinese military strategy involving the DPRK must also take into account China’s other priorities. How should China balance its security stance vis-à-vishe DPRK while simultaneously trying to provide a stable global landscape to allow its Belt and Road Initiative (BRI) to grow? How to balance foreign and domestic security concerns? What is the best strategy to allow China to reach its ‘New Normal’? This article will first highlight the major factors influencing China’s perceptions of the DPRK threat; and second, it will contend that China is adopting a more assertive military stance. Ultimately, this paper will argue that the likelihood of a Chinese military intervention on the Korean peninsula has now increased, and moreover, that Beijing would benefit from a tougher military stance. China’s East Asian insecurity rhetoric blames United States (US) troops, bases, and regional allies for surrounding China with a ‘containment by alliance’ coupled with efforts to undermine China from within. Of greater importance for China is the proliferation of nuclear weapons on the Korean peninsula. Conventional scholarly wisdom held that, should the DPRK acquire nuclear weapons, other states like Japan, South Korea and even Taiwan also would have pursued their own nuclear program. This has not been the case and it remains unlikely. China’s concern of a ‘nuclear containment’, therefore, only rests in theory. There is also the risk of proliferation of nuclear material and weapons to non-state actors, such as terrorist groups. Xi Jinping cannot afford this; the BRI must remain unthreatened and its economy must grow according to its ‘New Normal’. This complicates China’s pursuit of its interests and begs the question: will China intervene? The increasing securitisation of the Sino-DPRK border , the opening of China’s first overseas base in Djibouti, and the most recent report of a military base in Afghanistan indicate an increasingly assertive China, raising the perspective of Chinese interventionism. While it is noted that China has historically breached its policy numerous times, the DPRK may bring the official birth of Chinese interventionism. By no means will this situation create a stable Korean peninsula and increased pressure from the international community will test China’s non-interference sustainability. For China to reach some of its most important vital interests, it may have to reconsider its relationship and alliance with Pyongyang. At the same time, the Sino-DPRK alliance comes with its own benefits, too: a buffer zone. This provides Beijing with faster access to North-Korea, thereby allowing China to reach and secure the DPRK’s nuclear reactors and weapons before the US and its allies could. Furthermore, this middle-ground impedes the American military from reaching China’s border. It also allows China to project its political, economic and diplomatic outreach to the North. Of critical importance to the DPRK are Chinese energy exports. This buffer zone therefore presents a Chinese political extension covered by Beijing’s economic and diplomatic power, with the possibility of military action. Only time can tell what Beijing’s next significant move will be. China’s strategic calculus, more than ever, must also find a balance with ‘Xi Jinping Thought’ (XiJinping xindai zhongguotese shehui zhuyi sixiang). China’s pursuit of the status quo appears to be trickling down to its end. For the time being, it appears that China is biding time to create enough room for political, diplomatic, and strategic manoeuvre to rebalance the strategic calculus on the Korean peninsula. This does not signify a particularly decisive shift when historically compared. Nevertheless, the stakes appear higher than ever not only for China, but for the US too. US President Donald Trump’s rhetoric against the DPRK misguided; evoking military action without clear end goals will not solve anything. In fact, Trump’s rhetoric is accompanied by an inappropriate military approach: limited strike against DPRK nuclear facilities will not lead to limited conflict. Only time would be limited, before DPRK and China would intervene militarily. Limited strikes, therefore, may lead to unlimited war. Their post-9/11 military interventions point to this lesson. Trump’s threats are more likely to upset Beijing, ultimately raising hostility between the US and China, while simultaneously pushing one another further away. Instead, they should seek military rapprochement, which unfortunately appears unlikely for the time being. Furthermore, as Oriana Skylar Mastro points out, the deterioration of Sino-DPRK relations over the past two decades would lead Beijing not to intervene to protect itself, but to “secure its own interests”. In addition, during Xi Jinping’s most recent visits to the People’s Liberation Army (PLA), he called for them to be ready to fight, to win any war, and to “neither fear hardships nor death”. The PLA’s current modernization and restructuring further indicates this: by practising joint warfare capabilities, the CCP expects its armed forces to fight and win on its own. Yet, following the current Sino-American strategic mistrust, this would bring the US and China closer to war rather than closer to peaceful cooperation. Therefore, should Trump’s brinkmanship rhetoric cause conflict, the US and the rest of the world should not expect China to come to their help: China’s self-interests will trump American and global worries. The deployment of the US’s Terminal High Altitude Area Defense (THAAD) system to South Korea in 2017 represents just this. China has strongly opposed its deployment. The anti-ballistic missile defence system is currently deployed to counter the DPRK’s ballistic missiles. Although THAAD’s effectiveness  in the Korean peninsula is disputed, China feels particularly threatened by its capabilities, most critically its radar performance. THAAD can detect airborne objects over 1000km away, which is well within Chinese airspace. In addition, THAAD could strengthen the US alliance system in East Asia “by virtue of [its] technical characteristics” by allowing American and South Korean radars, and even Japanese ones if it also acquires THAAD, to be connected. Not only would this improve the alliance’s cohesion, but also improve the chances of hitting targets. Lastly, increased detection and response capabilities signify that any Chinese offensive would have very little surprise effect, thereby hindering its chances of military success. To check and balance THAAD, China may expand its nuclear arsenal and target South Korea “should hostilities erupt between China and the US”. Today, China would be better positioned to open its ‘lips and teeth’ and tell DPRK that it will “show your strength, carpe diem” instead of “hide your strength, bide your time”. Xi cannot afford a conflict over the Korean peninsula. He has already stated that China will not rescue the DPRK if it causes a conflict. The US has shown its willingness to fight directly against North Korea, meaning US boots on the ground and closer to China’s border, with North Korean refugees attempting to cross into China’s mainland. Xi must carefully and simultaneously balance China’s pursuit of stability on the peninsula, the strengthening of China’s national security, and the pursuit of Korean peace. 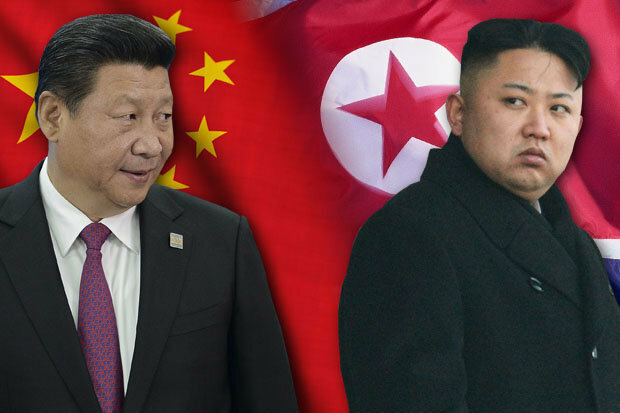 Currently, China appears to be attempting to wedge into the DPRK via diplomatic, political, and economic channels in order to restrain Kim Jong-un; any serious escalation will witness a Chinese military response to protect itself. Time is of the essence. Most recent military threats only indicate a tactical reaction to an eventual DPRK provocation. It remains difficult to assert with confidence what the US’s end goals in a war against DPRK would be. This only raises doubts whether the US has an actual military strategy intended to reach those goals. Brown, Kerry. 2013. “Is China’s non-interference policy sustainable?”. Blog. BBC. http://www.bbc.com/news/world-asia-china-24100629. Channel News Asia. “Troops, cameras, radiation: China preps for North Korea crisis”. Blog. Channel News Asia. 2018. https://www.channelnewsasia.com/news/asiapacific/troops-cameras-radiation-china-preps-for-north-korea-crisis-9876050. Cirincione, Joe. 2017. “No, We Cannot Shoot Down North Korea’s Missiles”. Blog. Defense One. http://www.defenseone.com/ideas/2017/09/no-we-cannot-shoot-down-north-koreas-missiles/141070/. Daekwon, Son. 2017. “China’s North Korea Solution”. Blog. The Diplomat. https://thediplomat.com/2017/07/chinas-north-korea-solution/. DeVore, Marc R. 2017. “Off the Radar? China, THAAD and Northeast Asia’s Alliances”. Global Asia 12(3): 68-75. Nathan, Andrew J. 2009. “Principles of China’s Foreign Policy”. Blog. Asia for Educators. http://afe.easia.columbia.edu/special/china_1950_forpol_principles.htm. Neriah, Jacques. 2017. “Chinese Troops Arrive in Syria to Fight Uyghur Rebels”. Blog. Jerusalem Center for Public Affairs. http://jcpa.org/chinese-troops-arrive-syria-fight-uyghur-rebels/. Toktomushev, Kemel. 2018. “China’s Military Base in Afghanistan”. Blog. The Diplomat. https://thediplomat.com/2018/01/chinas-military-base-in-afghanistan/. Yinhong, Shi. 2015. “Painful Lessons, Reversing Practices, and Ongoing Limitations: China Facing North Korea Since 2003” in Freeman, Carla P. (arg.). China and North Korea: Strategic and Policy Perspectives from a Changing China, 17-36. 1st ed. New York: Palgrave Macmillan. Zheng, Sarah. 2017. “China’s Djibouti military base: ‘logistics facility’, or platform for geopolitical ambitions overseas?”. South China Morning Post. http://www.scmp.com/news/china/diplomacy-defence/article/2113300/chinas-djibouti-military-base-logistics-facility-or. Zheng, Sarah. 2017. “Chinese border troops hold drills in sub-zero temperatures amid tensions on Korean peninsula”. South China Morning Post. http://www.scmp.com/news/china/diplomacy-defence/article/2121820/chinese-border-troops-hold-drills-sub-zero-temperatures.